One of our unintended great finds while visiting Paris was the at 29 Avenue Rapp in the 7th arrondissement, very close to the Eiffel Tower. Built in 1901, this Art Nouveau masterpiece by Jules Lavirotte is quite striking. The detailed door was designed by sculptor Jean-Baptiste Larrive and sculpted by a variety of others. If you happen to be in Paris, seek this beauty out! We waited for what seemed like ever for a man on the sidewalk outside to move. He just kept talking on his mobile and didn’t see at all impressed that I wanted to take a photograph of this door. I guess he was used to tourists snapping photos and moving on. I wanted something for my website that didn’t include his funny mustache! 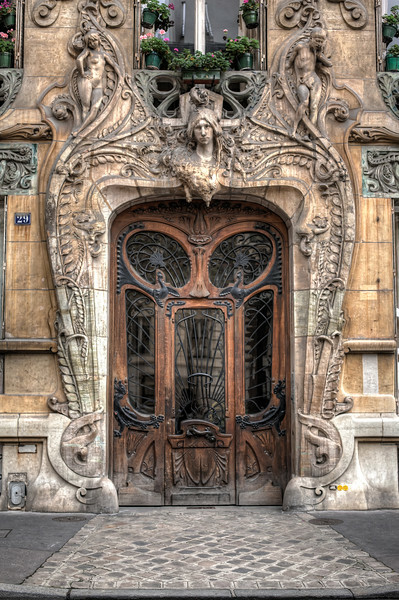 Posted in France, HDR Photography, Paris, Travel and tagged architecture, doors, France, Paris by Bri Duncan.